TLCC's Notes-Based User Training is the easiest, most effective way to train thousands of Notes users simultaneously - at an incredibly low cost-per-user. For one low site license price (significantly less than the cost of other training options) you get the two course to train your users on Notes 9 or iNotes 9. 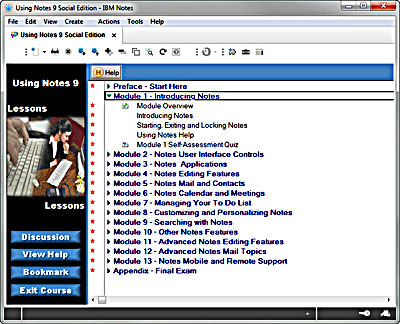 Using Notes 9 Social Edition - this course is for the people in your organization using the Notes 9 Social Edition client and covers how to use the integrated email, calendar, contacts and to do applications as well as working with elements found in all Notes applications including using advanced editing features, searching for information and much more! Using iNotes 9 - This course covers how to use iNotes 9 to access Domino mail, calendar and contacts using either a desktop web browser or a mobile device. The course can also be accessed via a web browser or a prior release of Notes to allow students to review the lessons prior to getting a Notes 9 client. Flexible Delivery - Students take TLCC’s courses using a Notes client. The course can be accessed from a Domino server or can be downloaded to the student's computer and taken locally. Students can access the course using the Notes 9 client, a web browser, or a prior release Notes client. This wide flexibility of access options accommodates different company and student needs. Lessons in the Notes 9 Sidebar - The Notes 9 Sidebar can also be configured via a policy to display a list of the lessons from the course. The user can then click on a particular lesson in the sidebar and that lesson will open in the Notes client in a new tab. System Requirements - A Notes 9 client is needed by each student to be able to take the course and do all demonstrations and activities. A prior release Notes client or a web browser can also be used to read the lessons. The Notes 9 client is still needed to complete the activities. The course materials can be placed on a Domino server or the local Notes client. Course Pricing - TLCC’s user courses are sold via a one-time site license based on the number of users in the Domino Directory. The site license includes access to both the Notes 9 and iNotes 9 courses. TLCC provides support for installation related questions for 30 days after purchase. The purchase of a maintenance contract allows for access to the latest releases of the user courses and installation and customization support beyond the 30-day period. This optional annual maintenance is available for 15% of the total license fee.